In 1984, the Breeders’ Cup began with seven races: Classic, Distaff, Juvenile, Juvenile Fillies, Mile, Turf, and the Sprint. In 2011, there will be 15 races over two days. The race order for Saturday is: Marathon, Juvenile Turf, Sprint, Turf Sprint, Juvenile, Mile, Dirt Mile, Turf, and Classic. Of the original seven races only five will be contested on Saturday, which is the day for races designated for colts and geldings. The final four races on Saturday will make up a $1.5 million dollar guaranteed pick four. The sequence is the Mile, the Dirt Mile in its fifth year, the Turf, and the Classic. These charts for the original Breeders’ Cup races include information about the past winners: win payout, track, exacta and trifecta prices, and trainer. Averages are calculated for all of the payouts and European grass winners are marked. The Mile is the race of repeat winners. Of course the mare Goldikova has won the last three Miles and goes for a fourth in 2011. Olivier Presslier and Freddy Head are the trainer and rider for Goldikova’s wins. Da Hoss (1996, 1998), Lure (1992, 1993), and Miesque (1987,1988) have won twice. The Niarchos Family has won the Mile five times. The Europeans have won the Mile 13 of the 27 races. Ten favorites have been victorious for an average price of $16.29. 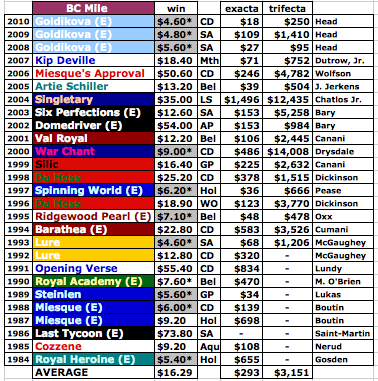 The biggest two dollar exacta ($1,496) and trifecta ($12,495) payouts came in 2004, when Singletary paid $35.00 to win. This entry was posted in Breeders Cup, Horse Racing Nation, Uncategorized. Bookmark the permalink.